As news of large-scale data breaches and vulnerabilities grows, new findings from the Pew Research Center suggest that growing numbers of online Americans have had important personal information stolen and many have had an account compromised. 18% of online adults have had important personal information stolen such as their Social Security Number, credit card, or bank account information. 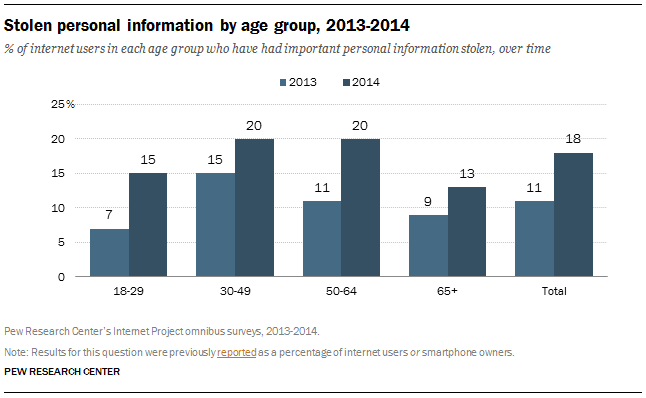 That’s an increase from the 11% who reported personal information theft in July 2013. 21% of online adults said they had an email or social networking account compromised or taken over without their permission.The same number reported this experience in a July 2013 survey. Last week’s discovery of the Heartbleed security flaw is the latest in a long string of bad news about the vulnerabilities of digital data. The bug, which affects a widely-used encryption technology that is intended to protect online transactions and accounts, went undetected for more than two years. Security researchers are unsure whether or not hackers have been exploiting the problem, but the scope of the problem is estimated to affect up to 66% of active sites on the Internet. In December, Target announced that credit and debit card information for 40 million of its customers had been compromised. Shortly thereafter, the retailer reported that an even larger share of its customers may have had personal information like email and mailing addresses stolen. In January, Nieman Marcus reported the theft of 1.1 million credit and debit cards by hackers who had invaded its systems with malware. The consequences of these flaws and breaches may add insult to injury for those who have already experienced some kind of personal information theft. And research suggests that young adults and younger baby boomers may have been especially hard hit in the second half of 2013. In our survey last year, we found that 7% of online adults ages 18-29 were aware that they had important personal information stolen such as their Social Security Number, credit card or bank account information. The latest survey finds that 15% of young adults have experienced this kind of personal information theft. Similarly, those ages 50-64 became significantly more likely to report that they had personal information stolen; while 11% said they had this experience in July, that figure jumped to 20% in January. Increases among other age groups were not statistically significant. As online Americans have become ever more engaged with online life, their concerns about the amount of personal information available about them online have shifted as well. When we look at how broad measures of concern among adults have changed over the past five years, we find that internet users have become more worried about the amount of personal information available about them online—50% reported this concern in January 2014, up from 33% in 2009. See questions and survey methodology. Mary Madden is is a senior researcher focusing on the internet and technology at Pew Research Center.